New vacancies in Indian Government: Recruitment for Officers & Office Assistants of 508 in Marudara Gramina Bank On Feb 2015. 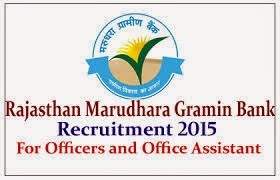 Recruitment for Officers & Office Assistants of 508 in Marudara Gramina Bank On Feb 2015. Educational Qualification : All Interested candidates should have completed Graduation Degree, Bachelors Degree, or its equivalent qualification from a recognized university / Board. Selection process : CWE-III RRB qualification & Interview. Application Fee : For General/OBC candidates Application fee 100/- and For All other candidates (PWD/SC/ST) application fee 20/-. How to Apply : All Interested and Eligible candidates may fill the online application through official website http://www.mgbbank.com on or before 26-02-2015. Important date to Remember : 26-02-2015. Click Here For the MGB Recruitment 2015 Job Detailed advertisement To Download.